Dental x-rays are an integral part of your dental checkups that occur twice a year. Yet, it can be a little intimidating to have one taken when you’re not exactly sure what’s going on. With your dentist out of the room, the whole experience might feel a little uncomfortable – not to mention plain weird. To lessen these concerns, it helps to know exactly what is going on during a dental x-ray and why. Today, we’ve put together a quick guide to dental x-rays to help you understand their uses and answer common questions you may have. X-rays (otherwise known as radiographs) are digital images depicting the internal state of something, particularly body parts. X-rays are a form of radiation in electromagnetic waves that are absorbed differently by soft tissue and dense tissue. Typically, x-rays pass easily through soft tissue (such as muscle) and this is what highlights the dense bones beneath the skin. Intraoral: Taken inside the mouth. Extraoral: Taken outside the mouth. Dentists commonly use intraoral x-rays in order to have the best understanding of your dental condition. This is because intraoral x-rays display the teeth, bone and supporting tissue of your mouth in great detail. What exactly do x-rays show? What are the benefits of a dental x-ray? 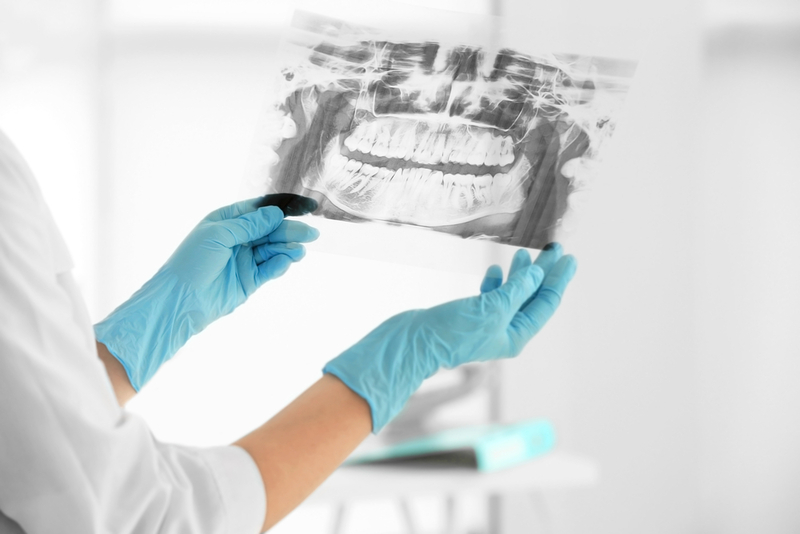 Dental x-rays are largely a diagnostic measure, meaning that they allow dentists to see issues you may be experiencing that are not visible to the naked eye. This gives the dentist a greater understanding of how to treat your problem. Dental x-rays can also be preventative. Since the dentist can see the changes occurring in your teeth, they may be able to prevent an issue from happening or stop it before it becomes more serious. The idea of an x-ray may be setting off alarm bells for you since it is a form of radiation. However, the strength of a dental x-ray is extremely low and is actually equivalent to the exposure you would receive on a 1-2 hour flight, according to the Australian Dental Association (ADA). Your dentist will typically leave the room during your x-ray, which may leave you confused, or asking yourself why you are exposed and they are not. Not to worry – they are simply limiting their ongoing exposure to radiation. This is because they are conducting x-rays daily and on a much more frequent basis than your bi-yearly checkup. It is important not to neglect your dental hygiene during pregnancy. Morning sickness, cravings for sugary foods and acid reflux all affect your teeth negatively. Without checkups at the dentist, you could be inviting a range of dental issues, including gum disease, gingivitis and tooth decay. It is generally recommended that pregnant women keep their dental x-rays to a minimum during routine checkups, particularly in the first trimester. While dental x-rays are safe, your dentist may still recommend putting off routine x-rays until the second trimester. However, if you require an x-ray for a more serious issue (such as a dental emergency or severe pain), then an x-ray may still be needed for your dentist to treat you effectively. Parents are commonly concerned about the radiation of x-rays and the impact they might have on their children. While it is true that children are more sensitive to radiation, the level of radiation emitted by dental x-rays is still classified as safe for children. If you are nervous about x-rays or have any additional questions, you should discuss your concerns with your dentist. Looking for a dentist in Berwick? Eden Rise Dental offers x-rays under our general dentistry services. Our dentists are friendly and sure to put you at ease while you undergo your checkup. Get in touch with us today on (03) 9702 6111 to book an appointment and keep your smile looking healthy.